The Giant Hand gets a giant hand. Love begins to blossom as Nazis, robots, and aliens battle. "Nurse" Haruko X-rays Naota's head to show him that his brain has gone missing. How many episodes of FLCL have you seen? This surreal dramedy follows Satou Tatsuhiro as he attempts to escape the evil machinations of the NHK. Seemingly unconnected citizens of Tokyo are targeted for bludgeoning by a boy with a golden baseball bat. As detectives try to link the victims, they discover that following the assaults, the victims' lives have improved in some way. Some high-school girls have their ordinary days disrupted when a guitar-wielding misfit rolls into their lives. Naota: Nothing amazing ever happens here. FLCL (short for "Furi Kuri", although I really have no clue how or why) is a highly stylized show. It's light-speed flow of dialog train-wrecks with the multitude of visual accompaniments in a strange combination of storytelling and all-out madness. There's no denying it, Furi Kuri will almost assuredly make you say "What the **** did I just watch?" I won't try to convince you of anything but that fact, nor do I feel anyone should. The show was made to warp minds while telling a tale - yes, there IS a plot underneath all this insanity - and cover as many genres, as many styles and subjects and tastes as possible. It is madcap entertainment, that's for sure. Any attempts to cover the storyline for this series feel as if they'll ultimately end in failure, primarily because saying too much would spoil the plot...and you can't tread very far without toeing that line. Therefore, I'll make an attempt at telling what I can, trying not to spoil anything. Naota is a sarcastic, smart-alec 12-year-old with a distaste for bitter drinks and sports a baseball bat at all times. He lives with his father and grandfather, and has a strange friendship with his older-brothers' girlfriend, Mamimi. Naota generally finds life boring in his town, a run-of-the-mill city with nothing out of the ordinary ever happening (despite the fact that there is a giant factory at the edge of town, a factory in the shape of a giant iron). 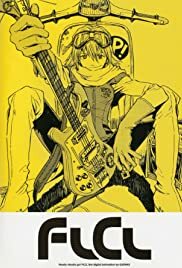 This dull life changes when, for no apparent reason, a pink-haired girl named Haruko shows up on a moped...and proceeds to plow right into Naota, sending headlong into an adventure he would most likely prefer to avoid. With the entrance of Haruko into Naota's life, everything - not just his everyday life, but everything else around the entire city - seems to become even stranger and stranger. Naruko apparently has some strange obsession with Naota, one that requires the occasional beating with a guitar (aw, heck...she does that to everyone). That's a fairly loose run-down of the series. However, the focus seems to be very, VERY far removed from such down-to-earth elements as "Following a steady plot" or "developing characters"; instead, Furi Kuri seems to lampoon anything and everything it can, from basic elements of life and society to American Television (yes, there is a South Park section in the series). It flows so quickly you feel as if you're being overwhelmed, yet at times the show appears to slow down, just enough to let the poor audience barely catch up...and then speed off again, taunting the viewers with its very appearance. How can a show be so cruel in its simple execution? Imagine a fairly normal scene of Naota reminiscing about his older brother (whom has gone to America to play Baseball). Naota then proceeds to walk into his kitchen, discovering Haruko has appeared at his house. Without any warning the show shifts into hyperdrive, transforming into a moving manga (Japanese black-and-white comic), telling the next few scenes with crazed voice acting and rapid camera movement, mimicking a person reading such a publication. There are moments when the show will shift to cliched Anime moments (the "gun-fight" camera, with characters flying about and spraying bullets) back to normal time simply because it WANTS to. The show is driven by a madman, driving to make madmen of us all. ...and yet somehow the show is comprehensible after a few viewings, subtle moments once misunderstood now coming in clear(er). You get the feeling of several layers of meaning coming from all angles, several topics being touched upon, the show proving that it is more than just a crazy attempt at randomness in entertainment. The last episode, while lacking any true "tying up of loose ends" at least brings all events of the past to a pseudo-close, bringing an understanding to the basest wackiness exhibited. Usually, I find myself enjoying shows that are able to combine elements into powerful scenes - Cowboy Bebop is a good example of this, splicing wonderful jazz and rock with the action pacing of each section of the series. Furi Kuri, however, throws this concept right out the window, apparently making the attempt at clashing anything and everything they can without wholly losing its sanity in the process. The music, performed by J-Pop (J-Rock?) group "The Pillows" has a rock/punk edge to it, yet feels easygoing and fun to listen to. This music almost seems out of place when taken in conjunction with the wild action and oddities that are viewed; large fights take place with simple guitar-riffs in the background, appearing as an attempt to downplay the action as nothing more than a childs' imagination. One could probably get away with calling this show a visual representation of a childs' imagination, actually. It only has boundaries where it sees fit, it plays whatever music it wants to whenever it wants to, and it jumps from topic to topic as if it suffers from ADHD and has ingested a few bowls of sugar. The people may stay the same (for the most part), but everything else defies logic, reality, and reason. Despite its extremely varied existence, I enjoyed the series immensely, and suggest it to anyone who wants to experience...well, anything. It doesn't single out certain topics - like love, friendship, actions, self-depricating humor - instead opting to tackle them all and mush them together into 20-minutes of super-phrenic television. 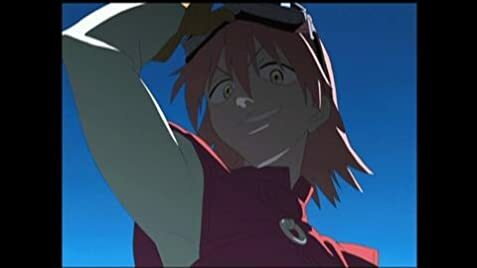 If you don't enjoy the absolute craziness of FLCL, then you should at least respect it for its ability to throw caution (and most everything else) to the wind and go with whatever it feels like doing. Hey, since when has 6 episodes of dementia been this fun?